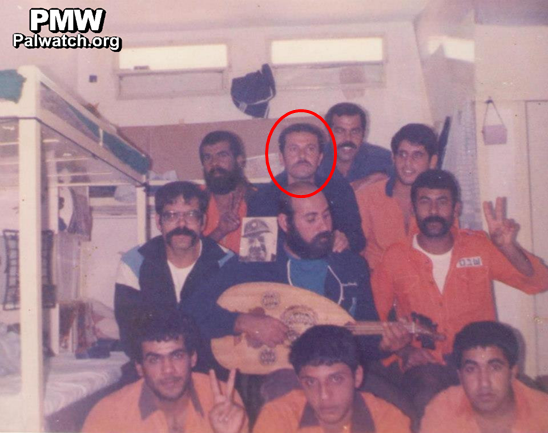 The new PLO Commissioner of Prisoners' Affairs, Qadri Abu Bakr, is following in the footsteps of his predecessor. The head of the commission is directly responsible for ensuring that the terrorist prisoners and released prisoners receive the monthly salaries prescribed by the 2004 PA Law of Prisoners and Released Prisoners and the ensuing regulations. "The Palestinian leadership - led by [PA] President Mahmoud Abbas and [PA] Prime Minister Rami Hamdallah - will make every effort for the prisoners, the released prisoners, and their families... we must not give in to the American and Israeli pressure on all that is connected to the salaries of the Martyrs and the prisoners." 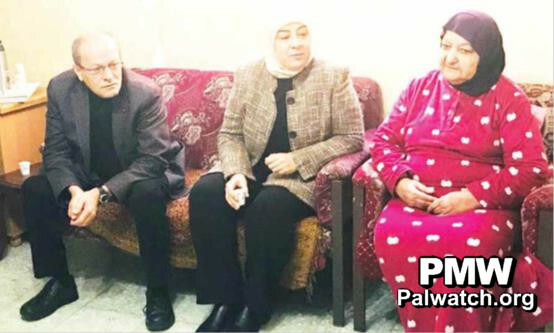 The post also mentioned that Abu Bakr paid a special visit to infamous terror-mom Latifa Abu Hmeid. Abu Hmeid has 6 terrorist sons currently in prison. 4 of her sons were convicted of multiple counts of murder and each are serving several life sentences. A fifth son was recently arrested and indicted for the murder of Staff Sergeant Ronen Lyubarski. The sixth son is being held in administrative detention. In addition, a seventh son of Abu Hmeid was killed in an attempt to arrest him after he murdered an Israeli. 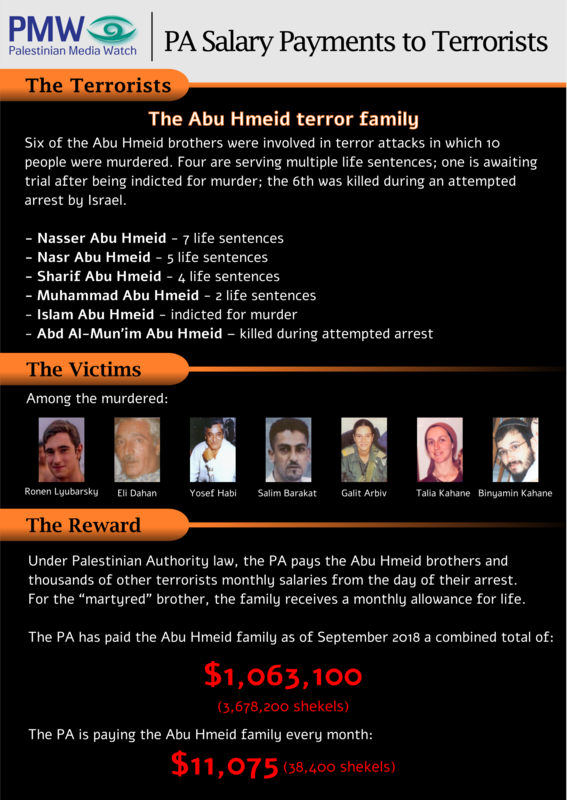 Having six sons in prison and a seventh son killed after committing an act of terror, the Abu Hmeid family is the recipient of the highest financial rewards for terrorism paid by the PA: Over $1,000,000. On the basis of the provisions of the Taylor Force Act coupled with the provisions of US Executive Order 13224, Palestinian Media Watch recommended that the previous Head of the Commission of Prisoners Issa Karake be "blacklisted" and designated as a sponsor of terrorism. Abu Bakr's commitment to continue paying the salaries of the terrorist prisoners and his special visit with the mother of six terrorist murderers, clearly demonstrate that he is also to be considered a terror supporter, following in the footsteps of his predecessor. Abu Bakr is also a released prisoner, having spent 16 years in an Israeli prison. Accordingly, PMW recommends that Abu Bakr be designated as a "sponsor of terrorism" in accordance with E.O. 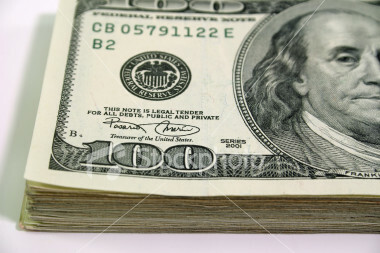 13224.